Preamble: INNTW reviews the Pre 2 | If not now, then when? I had an rough relationship with the Palm Pre last year, I loved the platform but in the end swapped it for an iPhone 4. The reasons were simple, poor quality hardware and sub par performance. As highlighted in my earlier posts, I dont tend to use many apps, sure on my iPhone I have plenty installed but my core are twitter, facebook and safari. Secondary Apps are lightbike and kindle. Shocking I know, but those are my main uses of both my iPhone and my iPad. Still I had the Pre – for around two weeks and it went from being a techno joy to being just plain annoying, I suspect that the fact that although my app need were satisfied, ‘this was as good as it gets’ put a dampner on things. Combine this with the dissapointing build quality and sluggish performance (I did overclock it but I feel it should be optional rather than mandatory) meant that the Pre and I were doomed. So why am I posting about the Pre 2? Well as said I’m a big fan of the WebOS platform and when Palm announced it was setting up a developer device program, I signed up immediately. A couple of months later (due to the overwhelming popularity of the program) and I recieved my Pre 2. So what’s it like? Pretty impressive. It corrects many of the Pre’s deficiencies, the touchstone coating over the entire surface of the Pre makes it much nicer to hold, I suspect it will pick up less scratches that the hard plastic of the Pre -. Further enhancing the Pre 2 is the redesign of the front of the phone. These consist of two changes, first (and arguably most importantly) a change to a Gorilla Glass screen. The plastic screen of the Pre – was a real let down for me, it just made it feel cheap and it scratched incredibly easily. The other major change is recessing the ear piece, it’s a simple change but it creates a very iPhone like appearence and brings the Pre 2 closer to a premium device. The keyboard is much improved, I had found myself getting more and more frustrated with the onscreen keyboard of the iPhone 4, so the transition was welcome. The key action is more satisfying and I find myself making far less mistakes, the cheese grater edge is still present. However, the slider seems to be the same sadly and there is ‘Oreo shimmy’ present, which jars slightly with the rest of the improvements, I don’t have great confidence that the Pre 2 will handle a short fall any better than the original. Performance is a strange combination of improved and sluggish, launching apps is much improved and TMC has not reared it head just yet. The touchscreen seems to be far less accurate than that of the iPhone 4, I’m not sure of the reason but I find that in some instances, multiple presses are required to make the phone recognise the button press. There are also noticeable pauses when using the gesture area, especially if you switch on ‘advance gestures’. Now lets get on to the important bit, software. The changes in WebOS are stunning, I love just type. It enables me to quickly and easily find/search both locally and on the internet. For example If I wanted to find out where Pecroino Sardo came for, I simply swipe up and start typing and I can choose to search for it using twitter, wikipedia and the internet. I can also instantly see how many emails and messages contain that term. You can also add custom search engines (e.g. WordPress), if a website supports just type a notification will pop up at the bottom of the screen and you can install it. Stacks, are a simple but very well thought out idea. 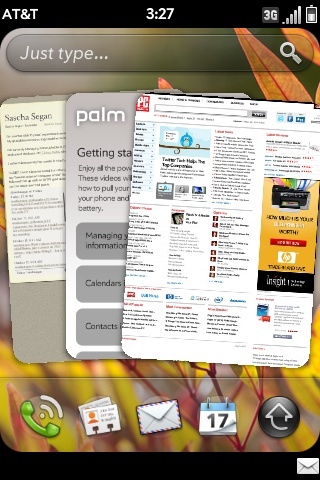 As we know WebOS is a true multitasking OS but having multiple cards open can make linked information hard to track. Stacks solve this by stacking (shocking I know!) related items on top of each other. So if I have an email with a hyperlink in it, if I choose to open that link it will stay with that email rather than go to the end of the card list. Both are brilliant ideas and available no where else, these are the features that HP need to be screaming from billboards, but that’s a different subject for another time. Overall the Pre 2 is an improvement, its not perfect but I am making it my main phone, which is as close to a ringing endorsement as you can get.